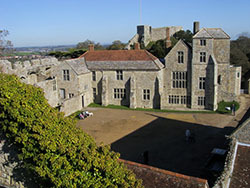 Events on the Isle of Wight in January, February and March cover winter into Spring. The Island is worth a visit at any time of the year, there are so many pretty places and so much to do even before the season opens. The Isle of Wight ferry goes all year. If you are into cycling or walking the poorer weather often does not stop you for you may love a challenge! Scenery on the Island is different in winter with the leaves off the trees and their branches reaching to the sky you can see so much more. Queen Victoria's home on the Island. Now run by English Heritage. For opening times click the link above. Beautiful place. Stunning would be nearer. Queen Victoria and Prince Albert built a new house in 1845 on the site of an existing house they had bought. In 1902 it was given to the nation and became a Naval College until 1921. 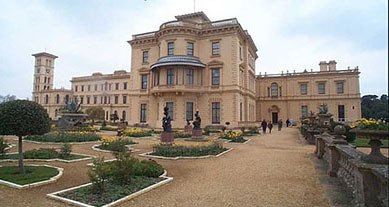 In 1954 Queen Victoria's private rooms became open to the public and in 1986 English Heritage restored Osborne House. Winter Fossil Walks There are three during February. 14th, 18th and 19th 2019. Annual Hedgelaying Competition Will be held on Saturday, 23rd February 2019. An old art and a competition of skill! Lots of prizes for competitors. Spectators welcome, so come and watch this ancient art in practice both with machine and hand tools. March Hare Fossil Walk 2nd March 2019. Meet at the National Trust gravel car park. Shanklin Chine. Opens again at Easter 2019. One of the oldest attractions on the Island, it still holds its magic. 24th March 2019. West Ashey Farm, Ryde. Why not take the Isle of Wight Steam Railway to the Ashey Scurry!! Ryde A major entrance to the Island. The town is pleasant and bustling and a major tourist attraction with its wide expansive sandy beach.That beach is the reason the pier is so long! Many events start in Ryde because of its easy access from the mainland. Newport is in the centre of the Island and the county town. The town is famous for Seaclose Park which is the famous venue for the very popular Isle of Wight Music Festival. Newport has port in its name as the town has a quay on the River Medina and that river flows out to the Solent, navigable all the way. Calbourne is a village a few miles to the west of Newport. There is a working water mill in the village on the River Calbourne, open to visitors. One can see stoneground flour being milled which is also sold in the shop. It makes a great day out for it is a pretty place with quite a few things to do. Yarmouth Another entrance to the Island, this time on the west. Makes an excellent holiday centre for there are trips around the Island. Quite an attraction during late summer is the paddle steamer which takes visitors round the Island. Ashey is most famous for the amateur horse races above! 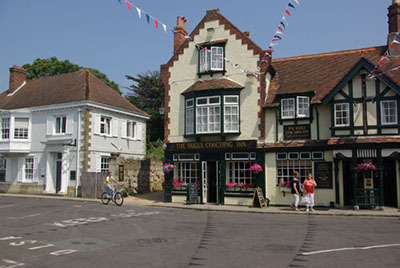 It is a small place close to Ryde. Anyone with events on The Isle of Wight who would like to list their event here please contact us via the Feedback form, we would love to hear from you. The event should have its own website so that our visitors can find you and obtain more information. The events on the Isle of Wight should be capable of attracting crowds, large village fete size and above, similar to those listed here. We reserve the right not to include events on The Isle of Wight that are not suitable for legal or other reasons. We hope you have a pleasant stay and an enjoyable event. Or you may wish to browse around some more - please do. You will find the links above on the left.